2018/9/5: Hexter is one of the FM software synthesizers selected for the Open Source Music FM Synthesizer Challenge!! Go make music with hexter or other open-source FM synths, and win fame and glory! 2018/3/18: hexter 1.1.0 adds support for hosts which don't support run_multiple_synths(), for example, Carla and Renoise. Each plugin instance is run separately, and support for the global polyphony limit has been removed. 2014/6/10: hexter 1.0.3 fixes a bug which could cause hosts to crash when removing instances of hexter (thanks to Rui Nuno Capela). 2012/11/2: hexter 1.0.1 fixes a linking failure on some platforms. 2012/11/1: hexter celebrates its eighth birthday with an integrated patch editor and a version 1.0.0 designation. Also included are more patch loading enhancements, NRPN parameter mapping, and the option to use floating-point math in the synthesis code instead of fixed-point. 2012/10/22: hexter development has moved to github. Download tarballs of release versions are still hosted on SourceForge. 2011/5/24: Martin Tarenskeen has done wonders for hexter's ability to load different patch bank formats. 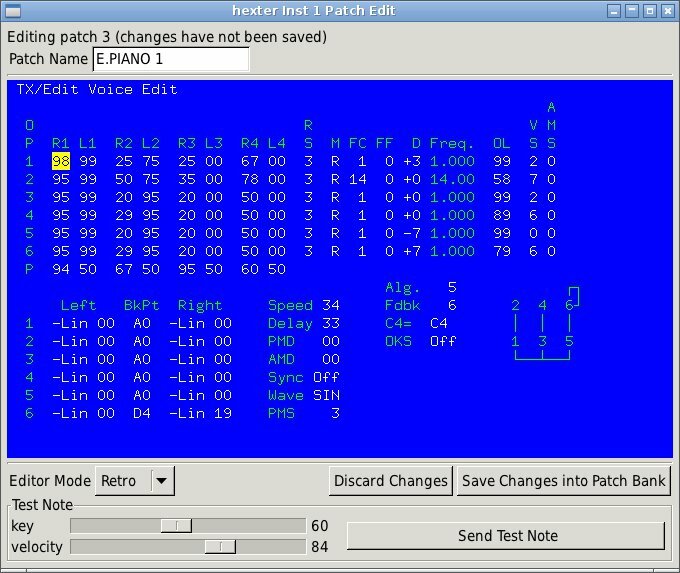 His DXconvert tool handles even more formats, plus it can load patches from several other FM synths and convert them (approximately, at least) for use with hexter. 2011/1/26: Bálint Pfliegel has created a C# port of hexter named Sixport. I was surprised that a virtual-machine based implementation of hexter's rendering code performs as well as Sixport does—pretty cool! With the right combination of hardware and operating system, one can even run it in a browser, as part of the Pluto DAW. Some demos can be found here. 2006/1/18: hexter version 0.5.9 released! New features include real-time control of the coarse frequency parameters, plus fixes for RPM, gcc 2.9x and 4.x, and Mac OS X 10.4 ‘Tiger’. 2004/12/29: hexter version 0.5.8 released! New features include a ‘volume’ control and MIDI CC volume handling, GTK+ 2.x or readline UIs, project directory handling, better error messages, and some new patches. 2004/11/16: Some recordings comparing hexter and a real TX7 are available here. hexter operates as a plugin for the DSSI Soft Synth Interface. DSSI is a plugin API for software instruments (soft synths) with user interfaces, permitting them to be hosted in-process by audio applications. More information on DSSI can be found on the DSSI website. copies of or links to music you've created with hexter. any favorite patches you create for hexter, or any patches that work on a real DX7 but not on hexter. a star on hexter's github repository. hexter benefited greatly from previous open-source efforts, most notably Juan Linietsky's rx-saturno, and FluidSynth by Peter Hanappe, et al. See the AUTHORS file in the hexter distribution for more details. DSSI version 0.4 or greater. liblo version 0.12 or greater (0.23 or greater recommended), a library implementing the Open Sound Control protocol. pkgconfig with PKG_CONFIG_PATH set appropriately to pick up DSSI and liblo. GTK+ version 2.4 or later. the ALSA headers (DSSI plugins use ALSA structures, but not the actual drivers, so you don't necessarily need the drivers installed.) Users of non-ALSA systems may use libdssialsacompat. a working DSSI host. hexter has been tested with the jack-dssi-host available in the DSSI distribution, and with ghostess. Release versions of hexter may be downloaded from SourceForge. hexter uses GNU autoconf and automake, and pkgconfig, so installation is only slightly more complicated than ./configure && make && make install. See the README file for specifics. This screenshot (click the image for full size) shows the GUI main windows for three instances of hexter. Note that sys-ex editing is currently enabled in the channel 1 instance (details below). while this one shows the editor in ‘Retro’ mode. jack-dssi-host should start, and moments later the hexter graphic user interface should appear. Use qjackctl or aconnect to connect jack-dssi-host to a MIDI source, such as vkeybd. Begin playing sounds! If you get no response, try clicking the ‘Send Test Note’ button in the hexter GUI. This sends a note directly via the host to the plugin, so if you hear sound now, look for a problem between the host and your MIDI source. If you still don't hear sound, I'd look for a problem between the host and your output device. If you continue having trouble, you might recompile with DSSP_DEBUG bit 2 set, which will cause the plugin to continuously output a quiet buzz to help debug your outgoing signal path. hexter starts up with a default set of sound presets, or ‘patches’, that you can select either by selecting the GUI ‘Patches’ tab and clicking on the patch name, or by sending a MIDI program change from your MIDI source with the appropriate program number. The standard 32-voice bulk dump sys-ex format. These are 4104 bytes long, and you can find a million of them by Googling for ‘dx7 patches’. hexter places no restrictions on their filenames. The standard single-voice (edit buffer) sys-ex format. These are 163 bytes long. Raw packed patch data. These are 128 bytes per patch, and may contain any number of patches (although hexter can only load up to 128 of them.) Note, though, that if the file is 8192 bytes long and has any of the filename suffixes .tx7, .TX7, .snd, or .SND, the second half of the file will be ignored (Dr. T and Steinberg TX7 formats). Standard MIDI files containing either a 32-voice bulk dump sys-ex message or a single voice dump sys-ex message. If the file contains more than one qualifying sys-ex message, only the first will be used. Steinberg Synthworks format (5216 bytes long). Transform XSyn format (8192 bytes long). Voyetra SIDEMAN DX/TX and Patchmaster DX7/TX7 formats (9816 or 5663 bytes long). Yamaha DX200 editor format (326454 bytes long). You may use the ‘Import Patch Bank...’ option in the ‘File’ menu to import patches. After selecting the filename, you will need to specify the program number (0 to 127) at which to begin importing the patches. Several patch bank files are installed with hexter in <prefix>/share/hexter/. You may also export patch banks using the ‘File’ menu ‘Export Patch Bank...’ option. You can then select which of the formats to save in, and what range of patches to export. Finally, select the filename to which you want to save, and click ‘Ok’. tuning: sets the tuning of this instance of the plugin, as Hz for A-above-middle-C.
polyphony: Sets the maximum polyphony for this instance of the plugin. If you attempt to play more notes than this setting, already-playing notes will be killed so that newer notes can be played. ‘On’ - monophonic operation, where the envelopes are retriggered upon each incoming note on event. ‘Once’ - monophonic operation, where the envelopes are triggered only on the first note on of a legato phrase -- that is, if you hold one note while playing a second, the envelopes will not be retriggered for the second note. ‘Both’ - monophonic operation, where the envelopes are retriggered at each note on, and upon note off when other keys are still held. disable LFO/Mod/Perf (0.5.x compatibility): selecting this check box will disable the LFO, amplitude modulation, pitch modulation, and performance parameter enhancements provided by hexter 0.6.0 and later versions, forcing it to sound just like the 0.5.9 version. This is provided for backward compatibility with existing projects that used hexter 0.5.9. 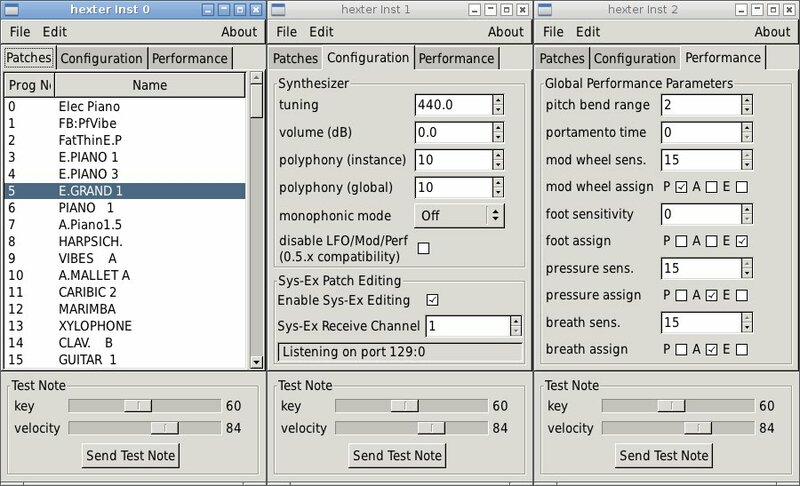 Sys-Ex Patch Editing: On ALSA systems, hexter has the ability to receive MIDI system exclusive messages from an external patch editor/librarian. Any patch edits received are reflected in hexter's built-in patch editor, and must be saved using the built-in editor's ‘Save Changes into Patch Bank’ button (see below). Sys-ex patch editing is enabled on the ‘Configuration’ tab by depressing the ‘Enable Sys-Ex Editing’ button. The hexter GUI then creates an ALSA MIDI client and displays its client and port number in the status window below the ‘Sys-Ex Receive Channel’ slider. Set the channel appropriately and route your external patch editor to this port using aconnect or similar, and the hexter instance will be ready to receive patch edits. Note that hexter only receives MIDI sys-ex messages, and does not send them. Also, it only receives single patch dumps and voice parameter changes, so any ‘get patch data from synth’ or ‘send 32 voices to synth’ functions of your librarian will not work. 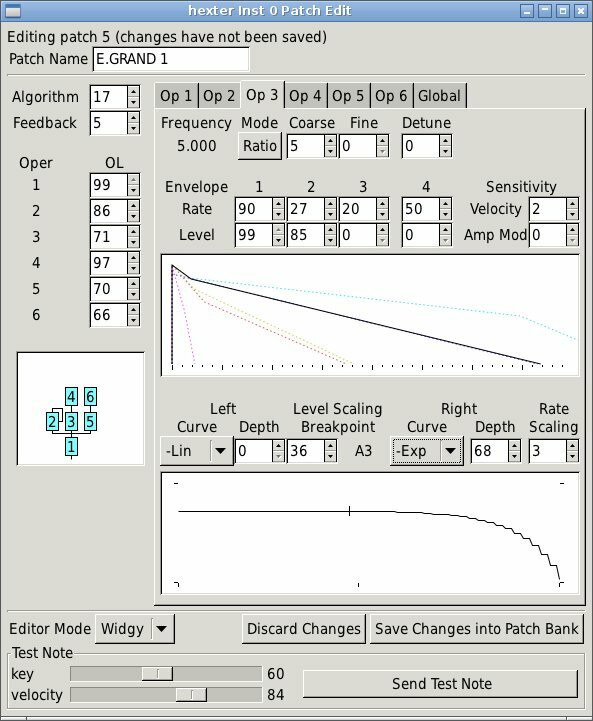 pitch bend range: sets the response to MIDI pitch bend messages, in semitones. portamento time: sets the portamento time. Note that as of version 0.6.1, the portamento code is still unfinished. mod wheel sensitivity: sets the depth of response to MIDI modulation wheel control change messages (MIDI control change 1). mod wheel assign: these three check boxes set which destinations the modulation wheel affects: selecting ‘P’ routes the LFO to pitch modulation (vibrato), ‘A’ routes the LFO to amplitude modulation (tremelo or wah), and ‘E’ routes the modulation wheel value itself to amplitude modulation. foot sensitivity, foot assign, pressure sens., pressure assign, breath sens., and breath assign: these set the sensitivity and routing as described above for the foot controller (MIDI CC 4), for pressure (both channel and key pressure), and for the breath controller (CC 2), respectively. Clicking the ‘Discard Changes’ button or selecting another patch from the ‘Patches’ tab will discard any active edits. At any time the top status line of the editor window will tell you which patch is being edited, and whether there are any changes in effect. The editor has two modes of operation, selected by the ‘Editor Mode’ combo box near the bottom left of the editor window. One mode, called ‘Widgy’, uses standard GTK+ widgets for editing patch parameters, and displays graphical representations of envelopes and scaling curves to aid in comprehension of the patch parameters. The other mode, called ‘Retro’ is based on text-based editors of decades past. You may switch between editor modes at any time. While the ‘Retro’ mode provides little in terms of visualization assistance, it can provide the experienced user with more efficient editing. Both the mouse and cursor keys may be used to select the parameter to be edited. Generally, the number keys are used to enter a parameter directly, the ‘-’ key decrements a parameter, the ‘+’ or ‘=’ keys increment the parameter, and the ‘delete’ or ‘backspace’ key will reset the parameter to a default value. Perhaps most convient for users without a separate MIDI keyboard, the space bar can be used to toggle a test note, even while changing patches with other keys! In addition to the performance parameter MIDI messages mentioned above, hexter responds to MIDI volume (MIDI control change 39), sustain pedal (MIDI CC 64), and all-sounds-off, all-notes-off, and reset-controllers control messages (CCs 120, 123, and 121, respectively). The operator parameters of the current patch can also be changed via the following MIDI control change (CC) and non-registered parameter (NRPN) messages. Messages marked with ‘*’ in the ‘Operator’ column will cause an immediate effect on playing notes, while the others will only affect subsequently-played notes. hexter can be compiled to do its sound rendering using either fixed-point math or floating-point math. The difference in sound quality should not be audible, so the question of which type of math to use becomes which type of math is faster. On many older processors (e.g. PowerPC G4), the fixed-point math is substantially faster. With newer processors, the speed of each type of math depends on several factors, including the particular processor, the compiler and the compiler options used. It is often surprising which is faster for a given configuration! On fairly normal posix systems (like Linux or OS X), you can compile a small test program, to test which type of math is the fastest on your processor. To do this, unpack the hexter tarball, cd into the fptest directory, type make, then type ./fptest. After 30-60 seconds, you should see a summary of the test results. By default, hexter is built to use fixed-point rendering. If your test results say that floating-point is faster, then you can configure hexter to use floating-point with the --enable-floating-point configure option. Here are some test results from a few machines. Percentages indicate the speed relative to the faster mode. * These three all come from the same machine! Q. The plugin seems to work fine, but the GUI never appears. Why? Q. What happened to the global polyphony limit? A. Support for the global polyphony limit was removed from hexter in version 1.1.0. Previous to this, hexter used the DSSI API function run_multiple_synths(), which enabled the global limit, but prevented hexter from working with certain hosts such as Carla and Renoise. The global polyphony limit is not usually needed on modern machines, and indeed, the run_multiple_synths() API is inherently incompatible with the utilization of multiple CPU cores. If you do need the global limit, perhaps for resource-constrained devices such as older machines and embedded processors, use hexter 1.0.3 instead. The Wikipedia Yamaha DX7 page. Dave Benson's DX7 page, had lots of information as well as links to patch files. The Synth Zone's collection of Yamaha links, which contains quite a few links to patch file collections. Copyright © 2017 Sean Bolton. Created with Sausage Grinder.